Honda's John Mendel, executive vice president, announces the 2017 Accord Hybrid and Clarity series of electrified vehicles. Photo courtesy of Honda. Honda sell plug-in hybrid and battery-electric sedans under its Clarity nameplate in 2017 as siblings to its hydrogen fuel cell vehicle with the same name. 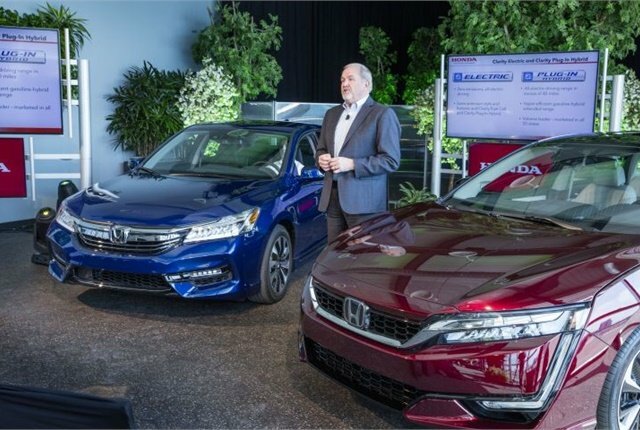 The trio of Clarity vehicles will join the Accord Hybrid as Honda ramps up its alternative-fuel vehicle offerings. Honda has set a goal to have electrified vehicles account for two-thirds of its global sales by 2030. Honda will begin rolling out the Clarity lineup in late 2016, when it begins deliveries of the Clarity Fuel Cell to California markets in late 2016. Honda will offer it with a monthly lease price of under $500. Honda will begin selling the 2017 Accord Hybrid this spring. Honda released few details about its non-fuel cell Clarity models, except to say that it would pair the Clarity Plug-In Hybrid with a hyper-efficient gasoline engine, and the vehicle would offer 40 miles of all-electric range. The Clarity sedans seat five, including the driver. The plug-in hybrid and EV Clarity sedans will go on sale in 50 U.S. states.